...in fast twitch-muscle fibers, only! Vladimir E. Martinez-Bello and his colleagues from Spain and France (yeah, the Tour de France has just begun ;-) have found that after no more than 3-weeks of thrice weekly subcutaneous administration of 300IU of rHuEpo, the expression of PGC-1α, mTFA and cytochrome c in the fast-twitch muscles of the gastrocnemius were significantly reduced (Martinez-Bello. 2012). 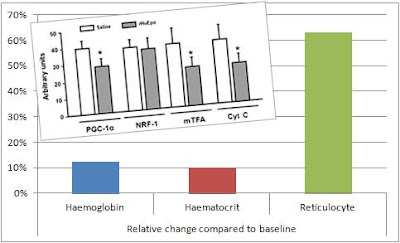 If you take a look at figure 1 you could certainly argue that this is a simple consequence of the increase in haemoglobin, haematocrit and the rediculocyte count and the subsequently increased oxygen delivery to the target muscle. Unfortunately, that does not really make sense, since that should be all the more important for the highly oxygen-depended slow twitch muscles in the soleus, where the expression of neither of the three enzymes changed. So, as Martinez-Bello et al. say "further studies are needed to address and clarify this issue as well as to establish accurate biological mechanisms". This may also explain the fact that the treatment did not ellicit any changes in maximal aerobic performance, something you would actually expect as a mechanistic consequence of the EPO-induced increase in oxygen transport. 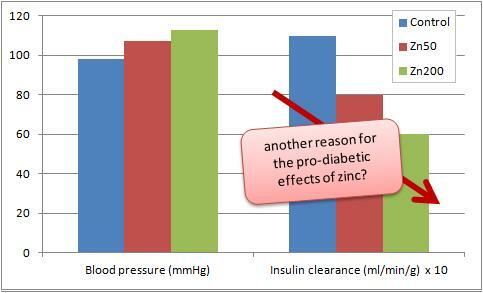 You already know that the long-term ingestion of high doses of zinc can set you up for insulin resistance and diabetes (cf. "Zinc: 15mg Are Plenty - After 120 Days Rodents on Diets Containing 2xRDA of Zinc Develop Metabolic Syndrome"). According to another recent study from the Health Science Center, Saitama Medical University in Japan (Kasai. 2012), excessive zinc intake can reduce renal function and thus indirectly elevate in blood pressure. 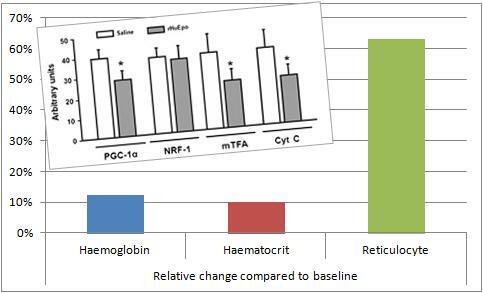 Pretty impressive data comes from a recent human trial on non-pharmacological interventions in patients with non-alcoholic fatty liver disease (Gianturco. 2012). As the data in figure 3 goes to show the combined effects of a colorically reduced diet (1,200kcal/day for women, 1,500kcal/day for men) with a macronutrient ratio of 26% fat (5% polyunsaturated, 14% monounsaturated, and 7% saturated), 25% protein, and 49 % carbohydrates, 400mg of alpha lipoic acid (ALA) and 300mg of ursodeoxycholic acid, a bile acid that is also known as ursodiol, led to profound improvements in all markers of non-alcoholic fatty liver disease. What is particularly remarkable, though, is the fact that these pronounced improvement took place in the absence of significant weight loss changes in blood glucose, insulin, HOMA-IR or triglycerides. In other words: It was not a side effect of improved weight loss, increased insulin sensitivity or the restoration of a healthy fatty acid metabolism. And what's best about all it: The treatment was side effect free! Image 2: It may be debatable whether or not running around in the dark is the ideal form of aerobic exercise, in terms of it's effects on your hemoglobin, platelet, etc. counts it does yet not make a difference when you train. Sunscreen from within? Coffee could hold the answer! - Although this is exclusively based on epidemiological data, it's interesting that Song et al. report that an increased caffeine intake appears to protect to against Basal cell carcinoma of the skin (Song. 2012). Men and women who consumed more than 3 cups/d had the lowest risk (10% and 21% lower than people who consumed only 1 cup or less). And while caffeine from other dietary sources (tea, cola, and chocolate) had similar effects, there were no benefits associated with the consumption of decaffeinated coffee. Estrogens protect against cardiac hypertrophy - If you are a friend of OTC or pharmacological estrogen eradication, you should be aware that the results of a recent study from the University of Colorado suggest that estrogen has preventive effects against pathological hypertrophy of the heart (Haines. 2012). And while this could explain why some of the non-aromatising anabolic steroids have more pronounced cardiovascular side-effects it should be mentioned that the study was conducted on female aromatase knockout mice and does therefore not necessarily translate 1:1 to humans, let alone men... the 2x increase in cardiac hypertrophy, on the other hand, is so pronounced that I would think twice whether or not it really is necessary to rid yourself from as much estrogen as possible, after all it appears to play an important role in skeletal muscle growth and repair, as well - see "Intermittent Thoughts on Building Muscle: Estrogen, Friend or Foe of Skeletal Muscle Hypertrophy?" Chevalier G, Sinatra ST, Oschman JL, Delany RM. Earthing (Grounding) the Human Body Reduces Blood Viscosity-a Major Factor in Cardiovascular Disease. J Altern Complement Med. 2012 Jul 3. Gianturco Y, Troisi G, Bellomo A, Bernardini S, D’Ottavio E, Formosa V, Lo Iacono C, Verrusio W, Marigliano B, Marigliano, V. Impact of combined therapy with alpha-lipoic and ursodeoxycolic acid on nonalcoholic fatty liver disease: double-blind, randomized clinical trial of efficacy and safety . Hepatol Int. 2012 Jul 3. Haines C, Harvey P, Leinwand LA. Estrogens Mediate Cardiac Hypertrophy in a Stimulus-Dependent Manner. Endocrinology. 2012 Jul 3. Martinez-Bello VE, Sanchis-Gomar F, Romagnoli M, Derbre F, Gomez-Cabrera MC, Viña J. Three weeks of erythropoietin treatment hampers skeletal muscle mitochondrial biogenesis in rats. J Physiol Biochem. 2012 May 25. Kasai M, Miyazaki T, Takenaka T, Yanagisawa H, Suzuki H. Excessive Zinc Intake Increases Systemic Blood Pressure and Reduces Renal Blood Flow via Kidney Angiotensin II in Rats. Biol Trace Elem Res. 2012 Jul 4.